This week's focus in the ICT in Primary Education course was 'Inspiring examples and implementation concerns'. I was grateful that the workload was lighter than last week's topic as juggling work and study is not easy. Only one week left, of both study and work! Yay for the holidays!! One of UNESCO's excellent publications was again the focus for the week. This time it was Section 4, Limitations and Concerns. The main problems mentioned were lack of funding, lack of technical support, outdated technology and poor infrastructure, lack of knowledge and confidence from teachers, lack of time for teachers to learn about ICT, and lack of involvement from management and also families. Another concern was privacy and security, including hacking, harmful sites and cyberbullying. the time it takes to try out technology before it's used in the classroom. There were concerns around how to fully integrate ICTs into the school culture and across the curriculum. Getting teachers to willingly integrate ICT into their teaching was a key point. Give ICT a real focus and value in the school. Include ICT in the school Charter. Have a good ICT infrastructure in place. 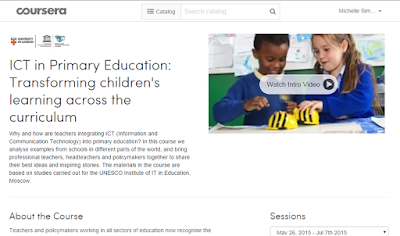 Encourage collaboration between teachers, pedagogical specialists and ICT coordinators. Engage parents by offering training and support. At the beginning offering technological courses and then offering continuing professional development for the entire staff. Offering training in small groups, allowing mentoring and differentiation. Training teachers to let students have time to explore ICT, learn and express themselves with it. Organising staff workshops led by staff for staff. It is important to make sure students are using critical thinking when looking at sites on the internet. She talked about teaching them what the domain suffixes mean and how they can find out who wrote the site, so they are questioning the source of the information. To make sure students are not just cutting and pasting she has her students visit multiple sites, take notes and put information in their own words. Her students help each other with problem-solving when their iPads have issues. You need to reassure parents that their children won't be on tech all day. The role of teachers is changing and it's a learning curve. Teachers need to look at a device as a pedagogical tool, then find out how many uses they can find for it, in small ways as well as larger ways (I love this point!). I've had another busy week trying to balance sick relatives in hospital, technical issues with our leased iPads (further details will be in another post), and the ICT in Primary Education MOOC. Plus I've had a sick child this week. Oh, and for some reason I decided it was good idea to see if anyone was interested in having a NZ school library chat on Twitter! It would have made a lot more sense to wait a few weeks until the course and iPads are dealt with but no, I'm clearly not thinking sensibly at the moment. This week there was a lot of information about what kind of technology schools are choosing to use and what criteria they are using in their decision-making. The trend is towards tablets and BYOD - the direction our school is taking. It is interesting that as environments become more technology-rich schools often advocate for a one-to-one strategy. I wonder if that is where my school is heading? The principle of developmental appropriateness, for recognising the most appropriate ICT tools, was a key framework that was considered to be important at a primary school level. It is known as DATEC (the outcome of The Developmentally Appropriate Technology in Early Childhood project), and is described in UNESCO's book 'Recognising the potential of ICT in early childhood education' (the last paragraph on page 25, and the table on pgs.26-27). There were several mentions of Bee-Bots in the literature. I haven't heard of them being used in NZ but they certainly are cute! I was really interested to see the use of email with younger students (Section 4.2 of the UNESCO book). I'm obviously a fan of blogging but in terms of interaction, actually getting a response from parents, I think email has the advantage. Parents are a lot more used to emailing than commenting on blogs - shouldn't we meet them where they are comfortable? If we wanted to combine the two we could personally email parents with a link to the blog and they could choose whether to comment by replying to the email or commenting on the blog. In the example given the teacher used the class email account to interact with parents, email other classes, send thank-you emails to visitors, and email relatives of the children living/travelling abroad and use that to learn about other countries. Also in the UNESCO book a teacher described how her students documented their daily life with the digital camera and used photos and videos of their work to present it to their parents using a digital photo frame. The reading on One-to-One Tablets in Secondary Schools (pg. 7-12) had a lot of interesting information on three schools' experiences with introducing tablets. Learning Management Systems were discussed, as a way for students to access digital content. My main concern with this is equity - what happens to those children who don't have access to the internet? Computational thinking and early programming were discussed. Things like programmable digital toys (e.g. Bee-Bots! 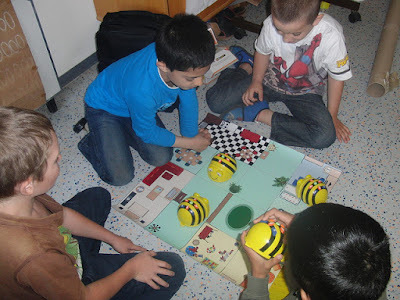 ), educational robotics sets (e.g. Lego WeDo) and educational programming languages (e.g. Scratch), were mentioned. Whoa! Good thing the weather was rotten this weekend because I spent a lot of time learning about teacher-y stuff so that I could understand how to do my first assessment (creating a 'Learning Object using ICT') for my ICT in Primary Education MOOC. It was time to learn about Bloom's Extended Digital Taxonomy, assessment rubrics and even a bit more about the New Zealand Curriculum. It was definitely more outside my comfort zone than previous weeks but I stuck at it and I've just submitted it - Yay! Learning styles and how to cater to different styles by using a variety of teaching methods from each of the categories. I read pages 40-46 from another really useful UNESCO report. I did a personality quiz and one on my type of intelligence - what fun! I read an interesting article on how to deepen student learning. I thought this UNESCO book on 'How Children Learn' was fascinating. It was nice to see a link to a report by a New Zealander on Bloom's Digital Taxonomy. I was a proud Kiwi! This site has over 2,000 learning and performance tools. There is also this Learning Technologies Pearltree. Both are useful sites if you want a range of tools that can perform a particular function. We covered 21st century skills. I think it is worth keeping these in mind when creating any learning activities. As well as being useful for surviving in the job market I also think they are skills that engage students in their learning. I found Kathy Schrock's site which links Bloom's to iPad apps (and other tools). We looked at some examples of teaching with ICT, including this Canadian government information, and this series of videos from a Hungarian school using tablets. There was actually lots more really useful information but I need to get on with my learning for next week! I am sure Coursera will run this free course again and I highly recommend it. Teachers are collaborating more by sharing ideas, materials, projects, research and knowledge with each other. This is also happening at national and international levels. Technology is supporting teachers by helping them do things like find appropriate resources, prepare their lessons and update students' records. The ongoing developments in technology are making it essential that teachers in engage in lifelong learning. Some teachers are still resistant to technology. ICT has encouraged teachers to implement more interactive, project-based and cross-curricular learning activities which increase students' engagement and motivation. It has also raised students' communication and research skills, as they learn to assess multiple sources of information, combine them, and present them in a coherent way. Technology is also providing students more opportunities to creatively express their ideas and learning. Teachers and students are increasingly able to use ICT to connect with others on a national and international level, bringing a wider perspective to their learning. Many students are extremely motivated by using ICT. ICT gives students instant feedback so enables them to work independently for longer periods of time. ICT encourages the important skills of communication, collaboration and problem-solving. Students can make mistakes more privately when they use technology. Students can use technology to help other students with their learning. When teachers are learning new technology skills they are modelling lifelong learning to their students. ICT has made administration tasks more efficient. A school in Brazil brought up the idea that with so much information available to students the role of the teacher changes, as they are asked questions they are not able to answer. They said, "Teachers can act like teachers (make questions, suggest guidelines, evaluate kids performance, help kids understand concepts, explain how to perform a specific procedure) while kids are using ICT, regardless of the teacher knowing or not knowing the details inside subject or topic that kids are learning" (pg.97). I think this is something that can make teachers feel uncomfortable, yet it is a natural consequence of moving towards project-based learning and emphasizing information literacy skills. One school from the Slovak Republic mentioned they had a computer club for students who have no internet access at home (pg.94) . I think this is an interesting point - if we encourage students to explore resources and learn at home then we must have a plan in place to support those who are disadvantaged by lack of access. Later in the chapter the researchers described some of the aspects around integrating ICT that teachers weren't expecting when they started the process. They were expecting that the transformation would take place more quickly than it did. They thought it would be easier to transform their traditional pedagogy to "harness the potential of ICTs" but this was not the case. It was also believed that new teacher graduates would bring with them digital skills and innovative ideas from their universities but that also has not happened. Finally, they weren't expecting that using technology to develop their own learning materials would be so time consuming. I was interested in one of the case study videos in which a teacher from a school in the UK described having their Year 6 students create a world in Minecraft and then the Year 4 students were invited into that world and did writing about being in there. I think showcasing older students' work and using that to inspire younger students is a fantastic idea. This is an area I would like our school to pursue more. 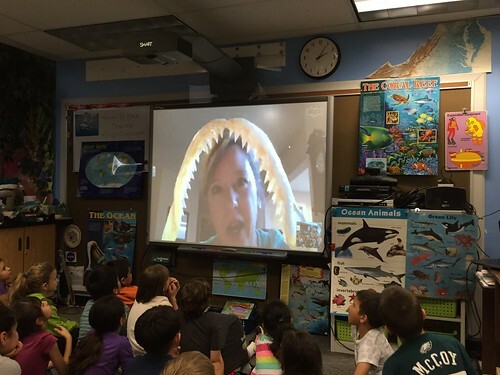 Gaining a global perspective on different issues, through technology like Skype, is an amazing and exciting way to expand students' learning. The challenge I suppose is connecting with the right people at the right time. We finished up by having a look at how students perceive the use of ICT in their school (pg.101-111). Not surprisingly they are enthusiastic and motivated and think that technology is fun. They like creating, digital storytelling and communicating using ICT. I was interested that some students liked the support that word processing programmes gave them when they were writing - "You can have a go at spelling a word and MS word tells you if it’s wrong and it helps you learn spelling" (pg.104). I have a son who is equally keen to write using technology, and for much the same reason! I am really enjoying this course so far. So much of what is discussed, in the forums and in the course videos and readings, is in line with my feelings and observations about ICT within my school. It is helping to clarify my opinions and also provide direction and pathways for the future. So, right at the moment I have a lot on my plate but I couldn't resist doing this course through Coursera (thank goodness for my understanding husband!). 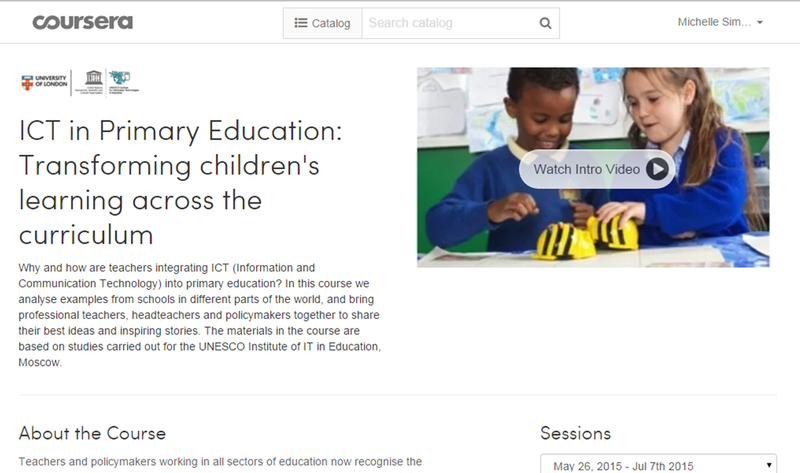 It is a free, online course run by the University of London and the UNESCO Institute for IT in Education. I did my Gamification course through Coursera in 2012 and found the six week course length an achievable one (I've tried several longer courses since but haven't managed to finish any!). There are students on the course from all over the world and it is interesting to see their viewpoints in the discussion forums. We were given a definition of the six learning types - acquisition, discussion, investigation, practice, collaboration and production. Then we were shown what these learning types look like with conventional technology and with digital technology. For me, this is a different way at approaching what technology can do. (Definitions are taken from Chapters 6-11 in Laurillard, D. (2012). Teaching as a Design Science: Building Pedagogical Patterns for Learning and Technology. New York and London: Routledge). In terms of the learning types an interesting distinction was made between what a student gets from discussion and from collaboration. With discussion you can 'agree to disagree' but when you are collaborating and have to produce something then you have to agree about what you are doing together. Learning through production is important because presenting their learning and showing it to others is a big motivator for students. I really liked this quote from one of Diana Laurillard's videos - "If we only ask ‘What can we use this technology for in teaching/learning?’ then we go along with doing whatever it is good for; we don’t sort out the problems we need to solve. So instead we say ‘Here is the teaching/learning problem – How can technologies help?’ And that way, we challenge the technology to help with the really important learning needs". The video prompted an interesting point, which is that you need to be careful when planning lessons that you think about what you are focussing on and whether the technology you choose takes time away from that. For example, if your focus is science how much time should you spend learning about iMovie? We read a number of chapters from this UNESCO publication, which is based on the experiences of 37 schools in 20 countries and is well worth a look. Here's a quote I liked from a U.S. school - “In our experience it takes a cycle of support and inspirational activities to keep staff motivated to integrate digital resources and to keep learning in the ever-changing field of technology for teaching and learning. The cycle begins with inspiring teachers with ideas for student learning and project examples, collaborative planning time for the teacher and instructional technology coach, classroom mentoring and modelling, support for teachers with professional development, the opportunity to reflect on learning and share successes and challenges” (pg.39). There was a lot about supporting teachers in the report. The importance of professional development came up several times. Teachers' confidence in their own use of IT was said to have improved but finding ideas to integrate it into the curriculum and their teaching in the classroom was where they needed help. "Examples of ICT-based learning activities" and "supporting teacher peer learning exchanges" were recommended. Give a greater role to ICT in development and assessment, as it is very motivating for learners to get immediate feedback. Give teachers and students one-to-one access as soon as possible. (In the discussion forum I shared this study, which found that young students performed better if they shared an iPad than if they had their own device. Something to think about!). From the earliest opportunity, provide consistent and frequent technology training sessions for staff members, so that they feel comfortable incorporating the technology, which can be uncomfortable or overwhelming, making some teachers hesitant to use the technology. The best way is to talk to the teacher, to understand the critical curricular topics they want to explore. Then present some suggestions and build a learning unit, or a project the teacher feels is important and really fits their needs. A key point was that teachers need to have the time to collaborate, to work out how best to use a technology together, and to re-use each other's ideas and lesson plans.